The Boynton Beach Art District will be kicking off their summer season with the highly-anticipated return of KeroWACKED 2018, the District’s annual spring multimedia festival inspired by the Beat Generation, also known as the Beat Movement. Originating in the 1950’s, this American social & literary movement managed to stake its claim over the nation’s consciousness following the highly influential works of a group of authors whose writings explored American culture and politics in the post-World War II era. Presented by ActivistArtista Gallery, this free community event will be held from 3-10 pm on Sunday, April 8, 2018 at the Boynton Beach Art District, located at 402-422 West Industrial Ave., Boynton Beach, Florida 33426. The theme of this year’s KeroWacked festival is “Women of the Beat,” which will highlight underrepresented female writers and influencers of the Beat Generation who are often overlooked by the fame of their male literary counterparts, including the festival’s namesake, Jack Kerouac. Joyce Johnson, Diane Di Prima, and Joan Vollmer are but a few of the leading women writers of the Beat Movement who will be honored at this year’s festival. Now in its 7th year, Kerowacked Multimedia Festival rounds up a collection of artists, musicians, poets, and writers who together provide the community with an inspiring day filled with entertainment and fun. The event will feature open art studios, live musical & literary performances, a variety of vendors offering their unique wares, as well as some of the area’’s most popular food trucks. This year’s talent will include Boynton Beach Art District’s resident artists: Rolando Chang Barrero, Nancy Divings-Edwards, Tobius Kinte, Diane Slobotkin, Dianett Doyle, and James Russo among others, as well as a great selection of local bands including Altered Roots, ReMerge, Grace Roots, Xotic Yeyo, Mood Swing, The Coven, and Silky Milky Sugar. 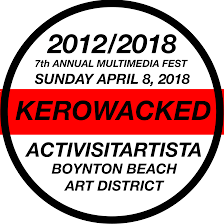 If you have any questions about KeroWACKED Multimedia Fest 2018 or would like to learn more about the Boynton Beach Art District, please visit the BBAD website. You may also contact the BBAD Founder, Rolando Chang Barrero at [email protected] or by calling 786-521-1199. We look forward to seeing you there!